A long time ago – before HTC got themselves into all sorts of financial problems, before UltraPixels, before Nokia and Microsoft got into bed together – HTC was a key partner in Microsoft’s mobile strategy. The Taiwanese manufacturer once made a lot of money manufacturing Windows Mobiles for other companies before they started trying to establish a brand with iconic handsets like the HD2, which to this day refuses to die. But when the iPhone happened, people lost interest in Windows Mobile. So HTC teamed up with Google to build handsets powered by Android, the new kid on the block. HTC have never really abandoned Windows Phone though, having produced most of the first generation Windows Phone 7 devices. We all know that Windows has less than 4% market share, and out of that 4%, about 90% of Windows Phones sold are made by Nokia. Continuing to make Windows Phones doesn’t seem like a great strategy for HTC – especially considering their current money problems. The trouble for HTC is that Microsoft claim that a number of technologies in Android infringe patents that they own, and a few years back negotiated a deal whereby in exchange for not being sued, HTC agreed to pay Microsoft a per-handset licence fee for the use of these patents and would also continue to build Windows Phones. Seemingly, HTC are caught between a rock and a hard place as their financial situation worsens. According to a recent report from Bloomberg, Microsoft are in talks with HTC to negotiate a deal whereby HTC will build phones that dual-boot both Windows and Android, in exchange for reducing the licence fee, or dropping it entirely. It’s an interesting prospect for both parties – HTC will be able to cut costs significantly in both patent licence fees as well as in R&D on separate Windows Phones; and Microsoft gains a much larger audience for their struggling mobile platform. Whether or not it is even technically feasible is another story, and whether users will even care is another problem entirely. You must be kidding. I remember Windows mobile 6 and I ain’t going there again…..the latest version looks god awful as well. Windows Phone isn’t too bad. I personally like it. Then why are you here reading about Android news!? 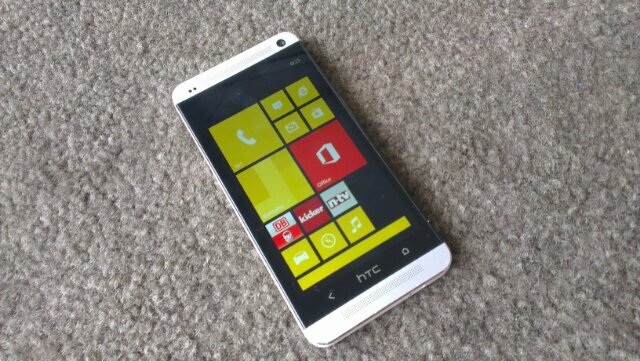 If MS are yanking hard on this old connedtract with HTC, then I’d start digging for Nokia rumours and info. MS are the desperate ones here. I’ve been dual-booting my HTC One with MoDaCo.SWITCH for a couple of months now – everything works fine, but it can be kind of a hassle. I just like to have options. That’s android to Android modaco is just an easy way of switching roms. Duel android and windows phone would be different in my reckoning. Just look at the hardware requirements for Windows Phone and compare them to Android. Not a lot of middle ground there. I don’t get where you’re coming from? There are a few dual android and windows tabs so it’s not like this upset been done before. I’d like to play around windows phone but I don’t want to buy a phone to do so. Who knows it might sway me over. I would potentially use windows phone…if I had the option for both. I NEED the android tinkering aspect. But to have it as an option may sway me to use both as I have other microsoft products. I agree. I’m a huge fan of what Microsoft are doing and I would love to be able to play around with Windows Phone, but I’m a tinkerer and WP just doesn’t allow for that. The OnePlus 7 Pro will be their first flagship phone with a flagship price thanks to a new “breakthrough” display · 37 mins ago. Stay cool with Sensibo’s Air Conditioner Controller on sale at a hot price · 56 mins ago.